Although economists debate to this day exactly what caused the Lesser Depression, a few facts stand out as undeniable contributors. In general terms, the crisis was able to occur because investors worldwide had become complacent during the decades of stable growth that followed WWII, almost “forgetting” the dangers associated with obviously risky high-return investments. As such, these largely Anglo-Saxon financiers allowed for “subprime” borrowers (i.e. those with high probability of being unable to continuously meet their loan’s monetary obligations) to receive mortgage loans that were then packaged with less risky loans into large bundles to seem more attractive to investors who then bought the debt. Investors trusted the credit ratings of agencies like Moody’s and Standard & Poor’s, who rated the debt as some of the safest available. However, these agencies were formed by the same banks that were issuing this packaged debt, making their assessments of the associated risk much more generous than they should have been. Coupled with the savings glut in Asia that pushed down global interest rates and European banks that borrowed heavily from American money markets to invest in unsafe securities, these faulty loans began to default in 2007 when banks’ confidence of their counterparties started to waiver, causing a chain reaction of uncertainty that led, in less than a year, to the collapse of one of the world’s biggest financial institutions – Lehman Brothers. Once Lehman Brothers failed, fear swept the global financial market and banks began failing all over the world as investors withdrew their capital as quickly as possible, deepening and spreading the crisis around the world. The overarching lessons of this crisis are concerned with the power that financial institutions and regulatory agencies are permitted. Governments around the world have learned not to allow banks to have as much independence or influence on the national economy as in the past. In fact, many argue that the deregulation of the market in recent decades is what allowed for the crisis to occur. When financial institutions overwent a regulatory overhaul in 1933 after the Great Depression through the Glass-Steagall Act, the US saw unprecedented financial stability and prosperity. With the weakening of this act, financial institutions began essentially playing by their own rules, leading to the crisis. In addition, complete trust cannot be placed in regulatory agencies beholden to the financial institutions themselves because of obvious conflicts of interest. If, as a global community, we allow another financial crisis to occur, you can work to protect yourself by maintaining a significant portion of your investment portfolio in low-risk investments like government-issued bonds or savings schemes. If you own stocks, you can make sure you earn money through this investment now and protect yourself against them dropping significantly in value by using tools like covered calls. Further, as a consumer in the market, you can be careful not to borrow more than you can pay back and not feed into market panics. You can also take guidance of Your Personal Financial Mentor about your investments in the stock market in order to safeguard yourself against expected risk. 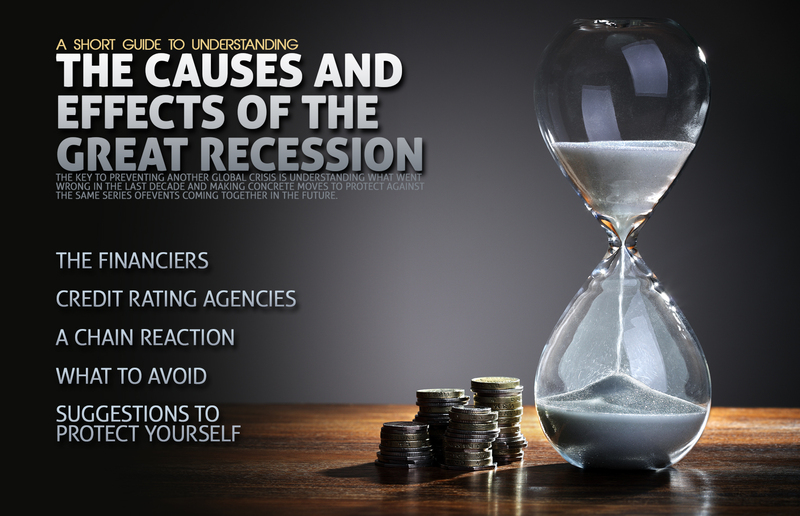 The Great Recession was caused by a myriad of factors, some that are still being revealed only today. Hopefully, governments across the globe have learned from the mistakes that led up to the crisis in an effort to prevent a similar event in the future. You can also take steps to avoid being severely affected by another crisis by investing smartly. For more information about the Lesser Recession, see The Economist.